The spring newsletter seems like a good place to introduce Jake to all of you. He is kinda new with us and we like him already. In fact, we like him enough to ask him for gear recommendations. And while we were at it, we asked a few others as well. Every year as the snow slowly melts away, the rivers start to rise. With now only weeks away from spring fishing runs, I tend to find myself scrambling to gather a vast disarray of fishing gear out of its winter resting place. If you’re someone who hikes/fishes rivers and is trying to cut weight and clutter in your pack, the collapsible Tenkara fly rod is worth a look. With a variety of lengths and weights they can be set up in seconds and pack down to almost nothing. Whether you’re trudging through brush to favorite brook trout hole or on a week-long hiking trip, this rod is a great addition to anyone’s backpack. There are many seasons on the North Shore between winter and spring; there is winter, I can’t believe it is still winter, fake spring, 2nd winter, everything is muddy season, actual spring, and maybe the best – WATERFALL SEASON. This year we had over 87 inches of snow which means our waterfall season is going to be epic. Hiking is the best way to see some of the most diverse waterfalls in Minnesota. I never forget to pack my wool Darn Tough socks while planning a hike. They pull the water/mud off my feet making them feel warmer and dryer than most socks. They never slip down and provide just the right amount of cushion (which helps prevent blisters). A good pair of socks definitely makes the hike more enjoyable. Because this map is reversible, I’m covered for both summer and winter seasons. I like how it has blow-ups of the trail heads and how to get to them. 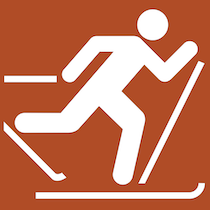 For skiing, it also shows which trail passes are required for each specific trail. Because of the durable paper it’s printed on, it is resistant to water, Gatorade, and red wine. If you like useful, practical equipment, this is one map that works when you’re packing it on the trail. As the ice begins to thaw and the water begins to flow, it’s a great time to start thinking about filtration in the backcountry. The GravityWorks water filter by Platypus is my filter of choice for a handful of reasons, the primary being its faucet-like filter speed at 1.5 liters per minute with minimal effort; simply fill the bag labeled “dirty” with water from a nearby water source, follow the simple instructions to attach the hose and filter to the bag labeled “clean,” hang it from a branch or something else sturdy at about head height, watch in amazement as the the dirty water becomes drinking water. We offer both the 2L system and the 4L system to accommodate large groups and solo adventures alike, and with little added pack weight.